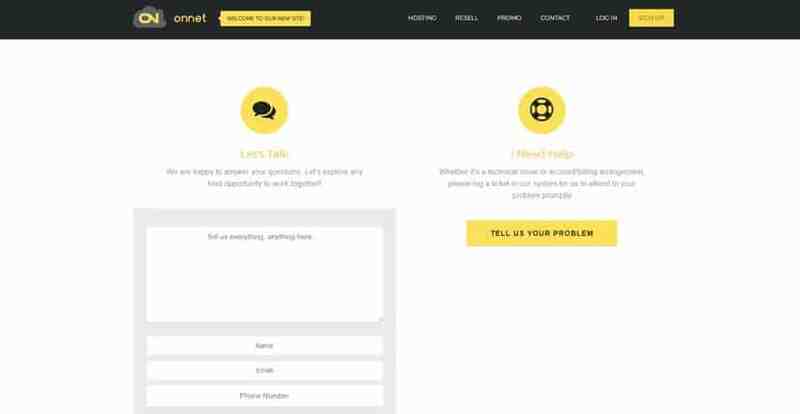 ONNET Review 2019: Is ONNET a Good Hosting? If you need cloud hosting with exceptional availability and performance as well as the flexibility to configure it according to your company’s requirements, then ONNET is a fantastic provider in Malaysia. ONNET is a Malaysian cloud hosting provider that was founded with one primary goal: to empower businesses and individuals to set up flexible, high-quality hosting solutions according to their needs. Having that singular goal allows ONNET to put together a very polished and convenient service for its customers. ONNET’s website and services are offered entirely in English. ONNET’s plans are structured by the level of reliability and resources your operations require. To that end, you won’t find the typical pre-made packages you’ll get with most other shared hosting providers. Instead, users consider the amount of downtime they can tolerate (one hour, half an hour, or five minutes per month), then select their packages accordingly. ONNET’s operational model is all about high-availability and performance, which is why the company has opted for cloud-based hosting. But no cloud infrastructure would be complete without top-notch hardware to accompany it. They boast carrier-grade servers with the latest Intel Xeon E5 processors, up to 24 parallel processing tracks, a minimum of 64GB DDR3 memory, and SAS & SSD storage. ONNET’s servers are also located in AIMS data center facilities, one of the top network facility operators in Malaysia. The fact that each customer gets dedicated access to his or her own bandwidth also means that you can take full advantage of the benefits of cloud hosting. You’ll also get access to a DNS tool along with cPanel and Softaculous to install all the scripts you need. While ONNET only has three packages available, you aren’t limited to just these. If none of the three cloud hosting plans suit you, you can always contact them for a customized solution. ONNET’s reseller hosting products are also configured completely on an individual basis. Although there are no “unlimited” options, you do get a decent amount of resources for the price. ONNET’s rates are also inexpensive considering that it’s a modern, cloud-based hosting service. What’s even more impressive is that all products are insured by an SLA-backed uptime guarantee, so you can rest assured that you’ll really get the uptime you’re paying for. ONNET also backs up its plans with a unique lifetime money back guarantee. In essence, the company will refund you for the remainder of your billing term, no matter how much time you have left on the plan or how long you’ve hosted with them. If you’re moving over from another provider, ONNET will even help you migrate your website for free — and reimburse you for the remainder of your contract with your previous provider. ONNET provides 24/7 support via a ticketing system. Phone support is only available between the hours of 9AM to 5PM (GMT +8), but I’d recommend submitting a ticket instead: in my experience, you’ll get problems resolved a lot faster through that route. Alternatively, you can check out ONNET’s database of video tutorials, which will guide you step-by-step on all essential website management tasks. Both the Professional and Premium plans come with high-priority support via the ticket system. With the Premium plan, you’ll also have access to a dedicated senior tech support agent. If you’re running a high-traffic business where even the slightest technical issue can cost you a bundle, this is an option to consider. ONNET is an extremely convenient, reliable, and scalable cloud hosting solution for SMEs. It’s a pity that the company’s reach is limited to Malaysia, however, as you won’t find this kind of reliability and support in many other places. Wondering how ONNET stacks up against other Web Hosting companies? Enter any other Web Hosting company and we will give you a side-by-side comparison.